The small northern town of Pinehouse, SK, is the centre of a contentious municipal election today. At stake is with whether the region will become host to a nuclear waste repository. Some opponents to the plan have reported intimidation and election irregularities in the lead up to the vote. PINEHOUSE, SK—Something is rotten in the State of Denmark, according to people in the northern village of Pinehouse, Saskatchewan. Residents contacted provincial officials to report irregularities and acts of intimidation at last week's advance poll in an effort to ensure a free and fair municipal election today. Longtime Pinehouse resident John Smerek sent a letter to provincial government officials reporting irregularities in the advance poll held September 12. In the letter sent Monday via email to Minister of Government Relations Jim Reiter and carbon copied to several other provincial authorities, Smerek highlighted process infractions such as the failure to abide by new voter ID requirements and acts of intimidation. 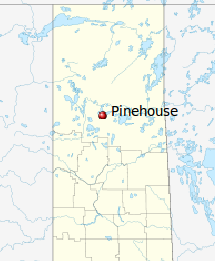 Along with two other locations in northern Saskatchewan and more than a dozen in Ontario, Pinehouse is currently part of NWMO's search for a "willing host community" for Canada's high-level radioactive waste. In 2010, Pinehouse Mayor Mike Natomagan sent NWMO an Expression of Interest, initiating the community's inclusion in the site selection process for a deep geological repository for the used nuclear fuel bundles currently stored onsite at nuclear reactors in Ontario, Quebec and New Brunswick. Today, tensions in Pinehouse run high with the municipal election taking place. Some residents are concerned that despite secret ballots, there may be negative consequences if they cast a ballot and the councillors who end up elected believe they voted for other candidates—whether they have or not, said Smerek. "Our current leaders have hired people that work for them that go around making offers and directions that sound like a threat—that they won't be able to service the people if they don't vote for the current leaders. And they'll try to lead them directly to the polls," he said. In one case identified in Smerek's letter, voters were threatened on their way to cast a ballot in the advance poll last week. According to an account of an incident by another resident who spoke on the condition of anonymity due to fear of reprisal, residents walking to the polling station were told by an individual affiliated with the current council not to expect anything at all from the village in the future, after they alluded to their plan to vote for candidates not currently on council. The Executive Director of Communications for the Ministry of Government Relations, Jeff Welke, responded via email to the Media Co-op's request for comment on the allegations of intimidation contained in Smerek's letter. "Prior to any round of municipal elections the Ministry holds workshops around the province for election officials...Pinehouse attended the May 9 session in Prince Albert. As well, the Ministry took extra measures to try and ensure that local election officials were aware of the new requirements including articles in 'Municipalities Today', guides and resources on the Ministry's website and the production of promotional materials that could be downloaded and used at the local level to help citizens become familiar with the voter ID requirement," wrote Welke. After last week's advance poll, Pederson again contacted Municipal Affairs officials—this time by telephone—to report irregularities and request intervention. The response from the central office in Regina indicated that the issue was a matter for the La Ronge office. When Pederson contacted the Northern Municipal Administration in La Ronge, he was informed that his concerns should be raised with the local village council implementing the elections process. Pederson is running as a candidate in today's election, on a platform based on honesty. He has been an outspoken critic of the potential selection of northern Saskatchewan for a nuclear waste storage site and of the process the council and the industry-led Nuclear Waste Management Organization have been pursuing during the site selection phase. They meet behind closed doors and the community is not informed of the meeting dates, Pederson told the Media Co-op in an interview last month. Pinehouse is not the only place in NWMO's site selection process where a council has come under fire for undisclosed meetings with NWMO. Shannon Quesnel reported in the Elliot Lake Standard that a meeting between NWMO and the city council of Elliot Lake was the subject of a complaint to and ruling by Ontario's ombudsman. In her September 5, 2012 article, Quesnel cites Elliot Lake City Clerk Lesley Sprague: "The mayor and five members of this city’s council attended [the NWMO meeting]. The ombudsman stated despite the fact the meeting was arranged and hosted by a third party, this does not relieve the municipality from giving notice of the meeting. And despite the fact the meeting was not closed to the public it is still considered to be a closed meeting because of the lack of public notice." Back in Pinehouse, Smerek is an outspoken opponent of Pinehouse and northern Saskatchewan being considered for the site of a nuclear waste repository. "Say No To Nuclear Waste" reads a sign on the front of his house, a stone's throw from the shore of Pinehouse Lake. For now, though, Pinehouse residents are focused on today's election. Smerek hopes his letter will result in the presence of an outside election monitor to ensure due process—including the chain of custody of the ballots—is respected. He has also requested the presence of an RCMP officer to ensure no intimidation or threats take place at the polling station. Sandra Cuffe is a freelance journalist and a member of the Vancouver Media Co-op. She is currently in northern Saskatchewan. This article was originally posted on the Media Co-op.